It doesn’t take much to sell me on a french toast recipe. French toast is, in a word, sexyawesometastic (and it tastes good too!). When the idea of french toast stuffed with Nutella and dark chocolate came to me, I knew I had ‘something’. Then I added a small drizzle of homemade berry compote, and a dusting of icing sugar, and that something became ‘something special‘. Also, what’s better than dessert for breakfast? 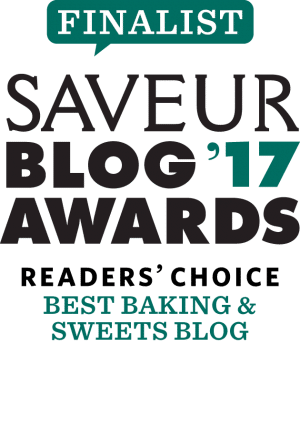 Not too long ago I happened upon a number of Nutella Croissant recipes on YouTube; they weren’t what I was looking for that particular evening but they did get me thinking (a rare, but occasionally productive experience!) about breakfast the following morning. And then it came to me, all at once, it was like having a delicious, chocolate covered, berry-coated loaf thrown at my face. Serves 1-2 people – Depending on how much you like to eat! Start by preparing the berry compote – mix the berries and white sugar in a ¼ cup of water, and leave the mixture to simmer (stirring occasionally) over a low-medium heat. Once the mixture has reduced slightly, lightly mash with a fork – don’t go crazy though, you want to keep that lovely berry texture. Whisk the egg, milk, and vanilla extract together and pour into a large flat dish. 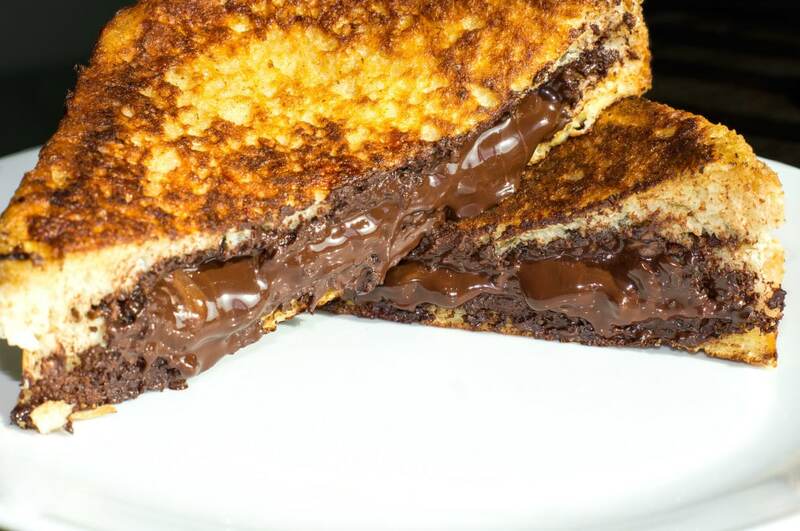 Spread 2-3tbsp of Nutella on one slice of bread, then place the two bars of dark chocolate towards the centre of the spread (they’ll melt down and create pockets of gooey deliciousness in the finished dish); use the remaining slice of bread to create a sandwich. Soak each side of your newly formed sandwich in the egg/milk/vanilla mix for a few minutes. Have you tried this recipe out yet? What did you think? What I love to do sometimes is slice fresh strawberries and add them to the Nutella and dark chocolate filling. This is one of those recipes that can be delicious in a 100 different ways. Comment below and let me know what you think! Want more Nutella? Give this Nutella Hot Chocolate a try! 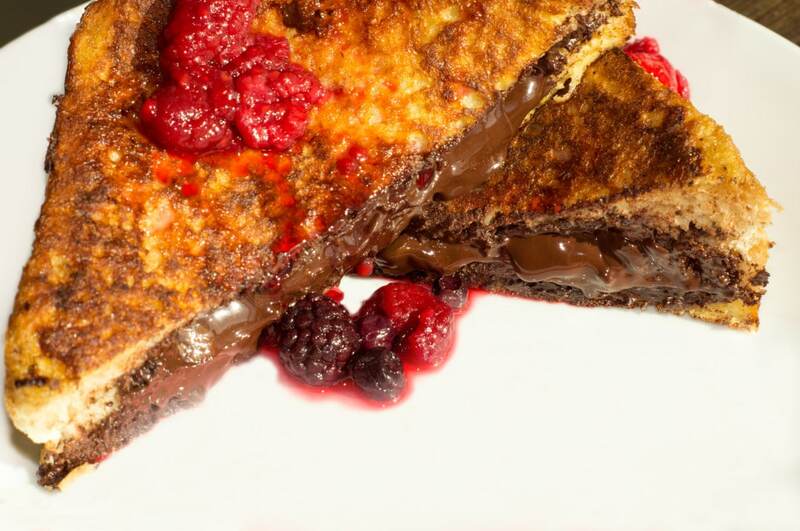 A deliciously decadent Nutella & Dark Chocolate French Toast recipe! 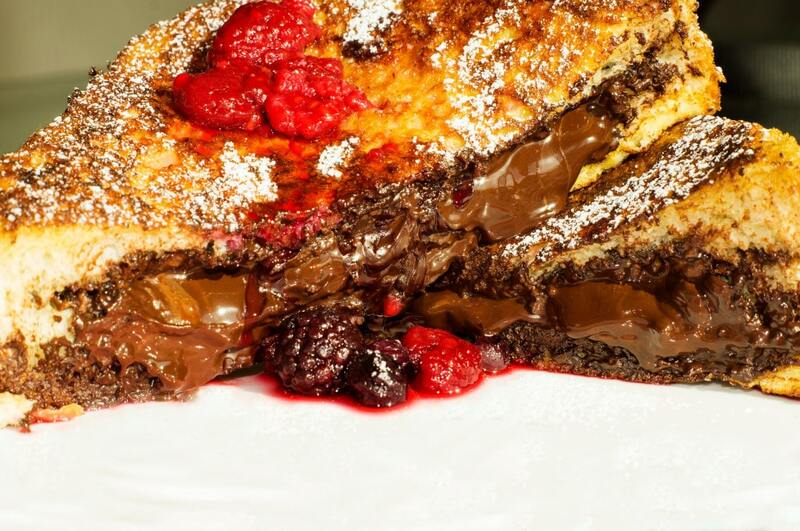 Who doesn’t like Nutella, or Dark Chocolate, or French Toast? Seriously. I hope you like it, it’s one of my personal favourites! Oh, that looks so good! I’ve never made those before and I def will next weekend! Thanks for sharing. THEY WERE SO GOOOOOOD!!!!!!! I’m going to make them again this weekend! Woohoo! I’m so glad to hear that Maya!!! Whoa! So decadent! This would make for a delicious holiday breakfast (with coffee, of course 😉 ). Of course…a holiday breakfast wouldn’t be completed without a delicious cup of coffee! That is my kind of breakfast! 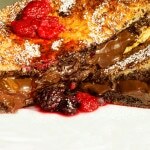 We made a Nutella and banana stuffed french toast, so we know how awesome it is! I love the addition of the berry compote. To me, chocolate and berries go hand in hand. Yummy!! I tried this recipe and it turned out yumm! I made it once without dark chocolate and that tasted nice as well. But adding dark chocolate gives tastier result. Hi Fatima! Thank you so much for trying the recipe!! And I’m so glad you enjoyed it!